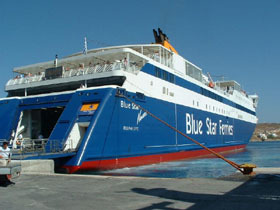 Most visitors use a ferry to come to Naxos. There are plenty itineraries during the day from Piraeus to Naxos port and specially in the summer. Some of the most famous ferry companies on this route are: Hellenic Seaways, Blue Star Ferries, NEL Maritime and G.A. Ferries. The duration of the trip is 3:30 to 7:30 hours and the ticket costs 35 to 55 Euro per person for an airplane-type seat depending on the type of ferry you will choose. There are also itineraries from Santorini, Syros, Mykonos and other islands but you have to check at a travel agency because they are changing all the time.